Canberra got the better of a fast starting Adelaide in game 1, but hey, this is the best of 3 series and all fairy tales have an obstacle to overcome. A packed stadium in Canberra, but something tells me Adelaide Arena might be a bit chock a block too. Nurse lead all scorers and KG23 was superb for Canberra scoring 0.76 points per minute of play, 12 boards and not giving away a foul. I guess those long Alaskan winters give you plenty of time to practice your skills in the gym and you can always practice your boxing out skills with the bears outside. All the Canberra starters got into double figures with the bench basically getting splinters all night, except for Harry's big sister. Canberra ran their bench pretty lean with 92% of court time split between 6 players. Adelaide spread their court time more evenly, but shooting % got them in the end, ending up 23 from 70 vs 35 from 73. There's probably not too much that Fairy Godfather Lucas would want to change going into this match except for practicing those shots, and boxing out. The scene is set for Chris Lucas to sprinkle some pixie dust, wave his magic wand and send this series into a third and deciding game. Double dribble just before, but looked like Seekamp got it off before the buzzer. What a win, what a game. Game 3! crowd 3,702 . great game by and for everybody. What an end to a game. if it was a weekend (saturday - not a junior night or a school night) game - they would have easily got another 1,000 - 1,500 there. Still a good show and plenty of support. Hahahaha the shot was late. Adelaide can only win with home cooking. "Hahahaha the shot was late. Adelaide can only win with home cooking." Can anyone please explain why Canberra would be up playing full court d from the end line when up 1pt with 5 secs to go? Literally all I've seen of the game was a tweet showing the dying seconds in dodgy-quality video, but it sure looked late to me. How is that not reviewable? I got Caps at $5 at the start of the season and I need to know who to start sending my death threats to if they choke in game 3!! It was clearly a double dribble by Nicholson leading up to Seekamp's shot even if it wasn't late! Still, a great contest overall and it looked like a good atmosphere with 3,500 in. A lot of people probably attended their first WNBL game tonight and will be back for more. The shot looked late at first from the main angle in real time because the TV clock went to 0:00 with the ball still in Seekamp's hands but if you go off the backboard lighting she just got it off just in time. Can NBL and WNBL get the incorrect time on TV fixed FFS? Absolutely amateur hour. To be clear the screenshot above was taken at the point where the backboard lighting first turns red. foxtel has end to end footage in replay - shots good. James Harvey fan also have a look at 2 sets of defenders hands in that play. Yes you could argue the ball was momentarily lost and regained so not a double dribble. "On the road, being able to put in this performance under trying circumstances. I'm at a loss to know some of the calls and some of the situations people were put under." Just to add another spanner into the works, I've seen the clocks at Titanium Security Arena show multiple times 0.3 seconds away from each other at times. There was a Canberra possession that took place with 0.0 on the shot clock, wasn't there? 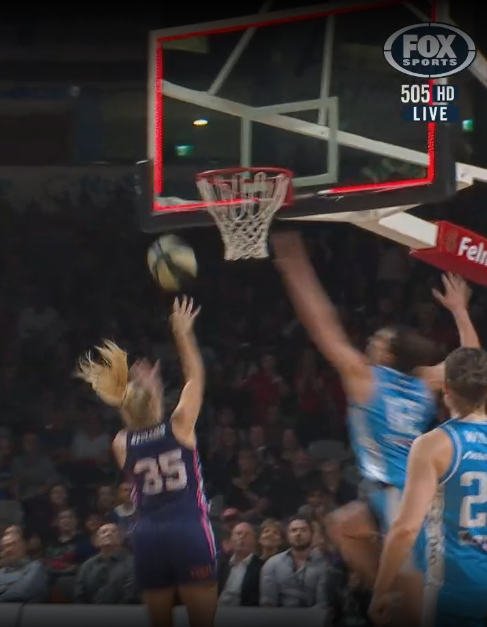 "Unfortunately the entire final play was one big blunder after another with a blatant Nicholson travel going unnoticed, before Seekamp's final shot still appeared to be in her hands when the final buzzer sounded." The thing is that there can't be IRS because only 15 games are professionally broadcast in the regular season out of 84 and how many stadiums have light up boards? Perth and Melbourne don't. Maybe it's time the elite league caught up with the entertainment league and became more professional and used what is required by FIBA for a national competition. Even if there couldn't be reviews for the entire season, couldn't you put them in for the playoffs? Doesn't the game end when a ref blows their whistle, rather than when the scoring gets to 0 or the backboard lights up or whatever? Jenny with a poor photo of an SD screen. The WNBL facebook page has a photo taken behind the basket with the clock on 0.0 and the red dot lit. The fact Foxsports are covering the entire finals series surely should have meant IRS was invoked to make sure incidents like this do not sour the finals series. Amateur hour. Even Jenny Froling's picture shows a gap between the hand and the ball. Not daylight, but a gap. The question of whether the ball got away in time is answered as "yes"
The big unanswered question, is what camera is she using? Was is off a Nokia flip phone? In relation to the final shot of the game, through the current broadcast technology the league does not have the capacity to implement an Instant Replay System (IRS) and has not for the past two seasons. Therefore, the call on the night stands. The league looks forward to another packed AIS Arena for Game 3 on Saturday evening. Not sure what else they could have said in the statement. If they thought nothing was wrong, why make a statement? The fact they made a statement means "Sorry stiff bickies Cap's". look at 2 sets of defenders hands in the last dew seconds. Was there dew on the ball? Lelani Mitchell is a class act . Minutes after losing by a point , she spoke to media . " At least we are back on our home court . It's also good for the League. game 3 thread please jack!